Director Jonás Cuarón has directed an almost unbearably tense and beautifully crafted thriller with his new film, DESIERTO. 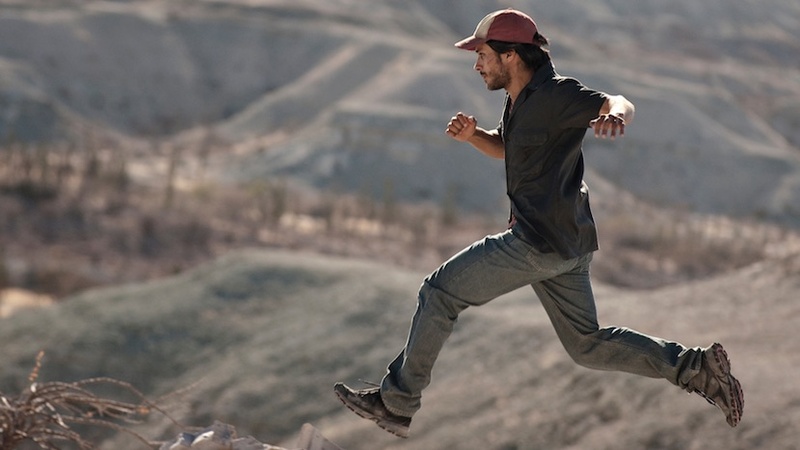 It stars Gael Garcia Bernal as one of a dozen illegal Mexican immigrants paying two guides to cross into the USA through a searingly hot desert. We start the movie in media res - there’s no back story or context - just a savage struggle to survive. When their truck breaks down, the people are forced to cross the desert on foot, which would be a tough enough challenge. But into the mix we find a racist ex-soldier (a frighteningly intense Jeffrey Dean Morgan) with a hunting dog and a sure aim. We’ve barely caught our breath before he’s picked off the main body of the immigrant party like so much game to be shot. And then the main body of the film begins, as he hunts down the remaining four Mexicans. That’s it. One location. Two key characters. One struggle to survive. And yet this film has a power that’s almost unbearable. There’s a purity to it - and also to the shooting style - the bleached out yellows and greys of the scrubland. But also massive kudos to whoever put together the sound design of this film. Not just the soundtrack but also the way in which sound effects, almost abstract, combine to build and modulate tension. The result is an austere western of immense power, sadness and beauty anchored by one of the most petrifying lead performances in recent cinema history. DESIERTO has a running time of 94 minutes. The movie played Toronto 2015 but does not yet have a commercial release date.